The North American International Auto Show, the Super Bowl of U.S. auto shows, really gets going Monday with a rapid-fire series of OEM announcements. Repairer Driven News will be there to cover the action. According to AutoGuide.com, we should expect the first appearances of the next-generation Toyota Camry, Chevrolet Traverse, Honda Odyssey, Lexus LS and GMC Terrain, among others. On Sunday, Kia unveiled the Stinger, a high-strength-steel-intensive muscle car, and Volkswagen showed off the next-generation Tiguan. The next-generation vehicle designs and features will affect the next several years of collision repair. We’d expect to hear about more lightweighting taking auto body design and work farther and farther from the old days of mild and high-strength, low-alloy steels and little to no aluminum. OEMs will likely announce the availability of more advanced drivers assistance systems which could prevent crashes but demand greater maintenance and electronics precision — including potentially more standard rearview cameras ahead of the 2018 rule. Finally, we should hear a word or two about the future of self-driving cars and the idea of ride-sharing instead of traditional vehicle ownership. 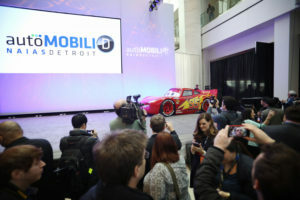 Stay tuned here for our live feed Monday, starting around 7:30 a.m. with the Chevrolet news conference at the Cobo. Or follow along on Twitter with @repairerdriven.